Dominik Jakubek (born September 2, 1979 in Santa Clara, California) is an American soccer player, who currently plays goalkeeper for Sacramento Republic FC in the United Soccer League. Jakubek bounced around during his collegiate soccer career, spending time at San Joaquin Delta College and Sonoma State University before ending up at California State University, Chico. At Chico, he started every match of his senior season and helped lead the team to the NCAA Division II Championship match. He was drafted as the third overall pick of the Milwaukee Wave in the 2004 Major Indoor Soccer League Draft. He was then traded to the California Cougars where he would spend the next season and a half. He did not gain his first start until March 2006, when starter Jim Larkin was injured. 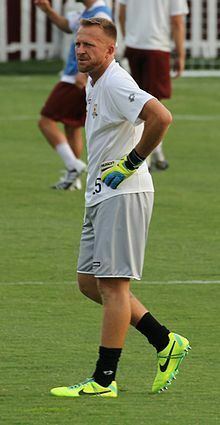 In June 2006, the Columbus Crew's starting goalkeeper Jon Busch was injured and deemed out for the season. With backup goalkeepers Bill Gaudette and Jonny Walker already out with injuries, the Crew was forced to trade for Noah Palmer and sign emergency backups, including Jakubek. Jakubek was waived at the end of the 2006 season, and signed for USL-1 expansion franchise California Victory in early 2007, appearing five times for the team during the season.